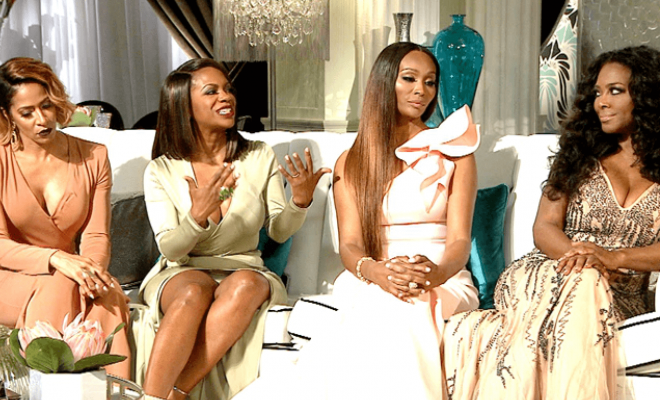 When part 2 of the Real Housewives of Atlanta reunion airs Sunday night with Andy Cohen sitting down with the women once again, Kandi talks about the night in Miami when Tammy’s nephew Glen caused a scene at the mansion. Kenya had suggested that Glen leave, and he completely lost it, even throwing Tammy on the ground. Porsha Williams tried to pin some of the blame for Glen’s behavior on Kenya for not letting security take charge of the situation, but Kandi thought she and the other women were going too far. “I get that, and I understand what everybody is saying, but at the end of the day, even if she did, it still doesn’t give him the right to turn around and be like, ‘Look here, little b—h!’ and come up to her aggressively,” Kandi says about Glen threatening Kenya. While some of the women nodded in agreement, others still insisted that Kenya was as fault for needlessly pushing Glen until he snapped. What’s your take? Sound off below in the comments!